Street's goal at 14:39 of the second period was his first in the NHL. 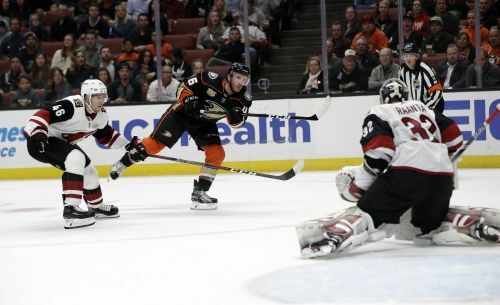 Anaheim's Jakob Silfverberg had a chance to win it late in overtime but fired wide of the net. NOTES: It was Arizona's longest goal drought to open a season, more than doubling the 67:11 mark at the start of the 1996-97 season. ... Two of the six goals Anaheim has allowed this season were short-handed. The Ducks and Flyers are the only teams to have allowed two so far this season. ... Arizona's Derek Stepan played in his 600th NHL game. He is the ninth player from the 2008 draft class and first non-first round pick to reach that milestone.